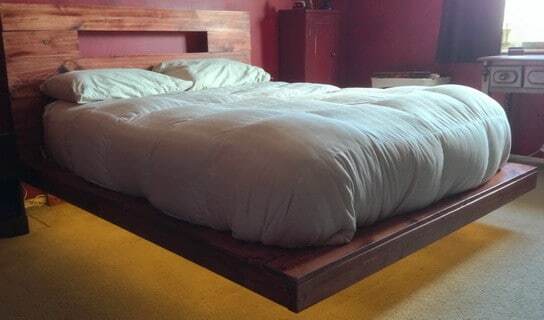 Want to build a bed and make it look like its floating in the air? 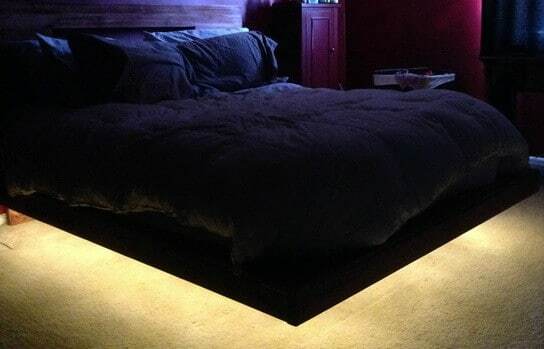 You can by building this bed yourself and adding a string of LED rope lights to the bottom. The wood for this project will cost around $300 dollars depending on where you purchase it from. The time it will take you to build this will be from 2 to 4 days. 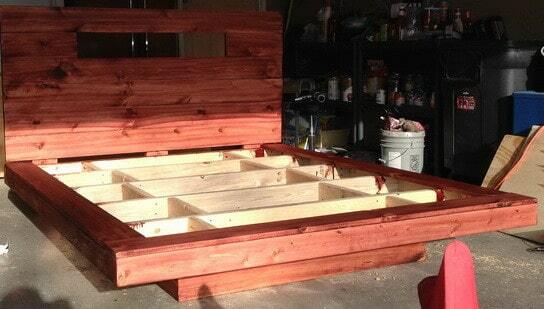 This woodworking project can be for a twin, full, queen, or king bed. The dimensions of this bed will vary depending on your mattress size. The top frame portion of the bed will be the dimensions of your mattress. 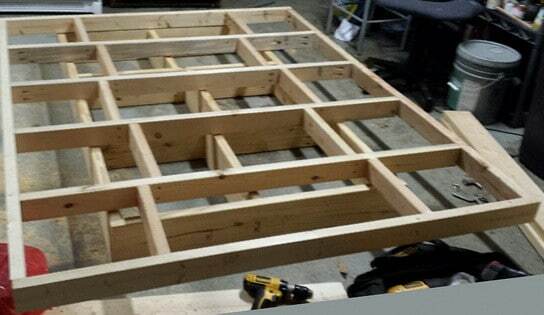 The bottom frame portion will be 1ft shorter on the sides and front to hide the bottom frame from view and give the look of a “floating” bed. See below for the step by step pictures. 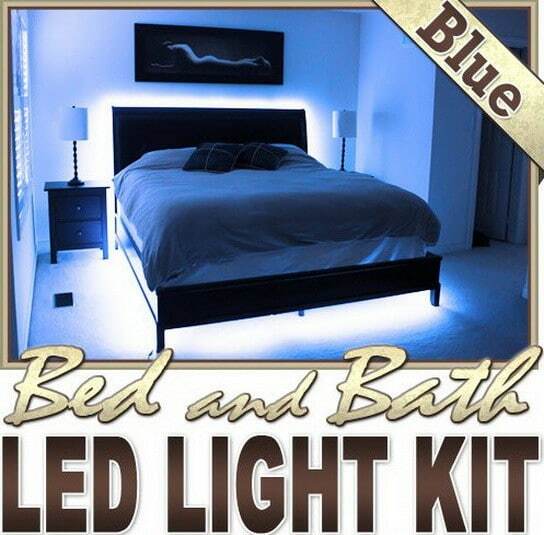 LED Bedroom Light Kit: Designed For Your Bed & Headboard. Here are the top and bottom bed frames stacked on top of each other to show placement. 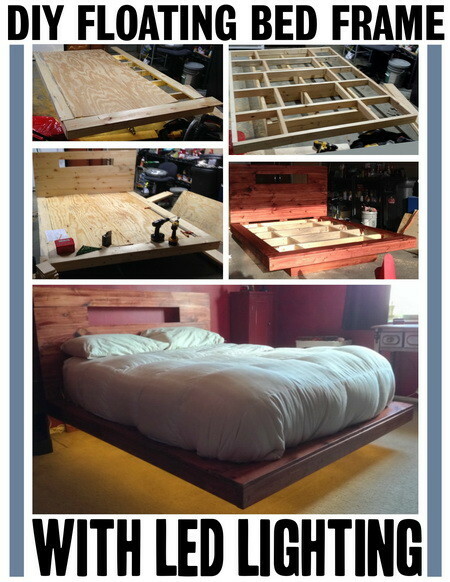 Holes were drilled and the LED rope lighting was snaked through the top bed frame for the floating effect. 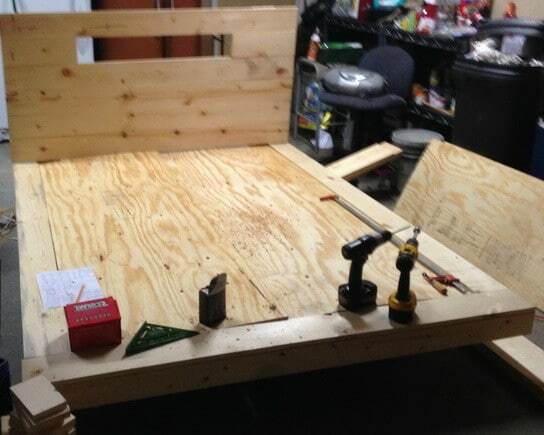 The plywood and 1×6 wood were then attached on the top bed frame for the mattress to sit on. The headboard was assembled and then attached to the rest of the bed. After the bed was fully assembled, it was sanded and prepped for wood stain. 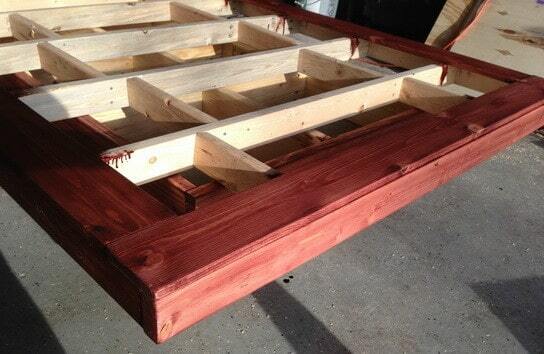 The bed frame and headboard were stained with a cherry colored wood stain and given time to dry. In a dark room the floating lights were tested again to assure everything was in place and working properly. The bed was moved into the bedroom with mattress on top to see the final product. As you can see in the pictures the bed really does look like it is floating in the air. Lights off in the room and bottom floating LED lights on. Looks Great. Instead of purchasing a string of LED rope lights, you can purchase an LED Light Kit For Your Bedroom. What about using 4×4 legs attached to top frame about 12 inches in from front and back corners instead of making a base to support it? Seems like it would reduce materials and work. I am not any sort of construction person, by no means at all…and I am fixing to make this project and had a question. Is there a chance of the top frame sliding or slipping across the bottom frame? If so, would it be best to just anchor the two together somehow? And mine will be on glossy tile, so I am going to place some sort of traction tape on the bottom frame so it does not slip on the floor. Any suggestions? Yes anchoring the 2 together would be a good idea. Anchor one in the front portion and one in the back and the bed cannot slip. The traction tape is a good idea as you have glossy floors. If you use high quality heavy wood most of your concerns will be solved. 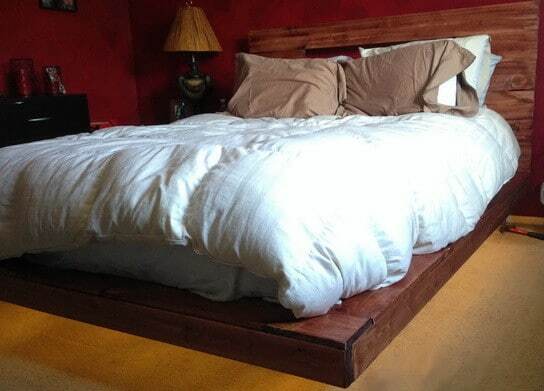 I just finished this bed and I love it, looks awesome and alot cheaper than buying a nice solid wood bed at the store. Altogether I have about $300 into it not including the mattess and I worked on it a little every night for 2 weeks after I got off work. Fun project and will be making some floating night stands to go with it. Went with a 2×10 bottom and a 2×6 top for extra height and it worked well. 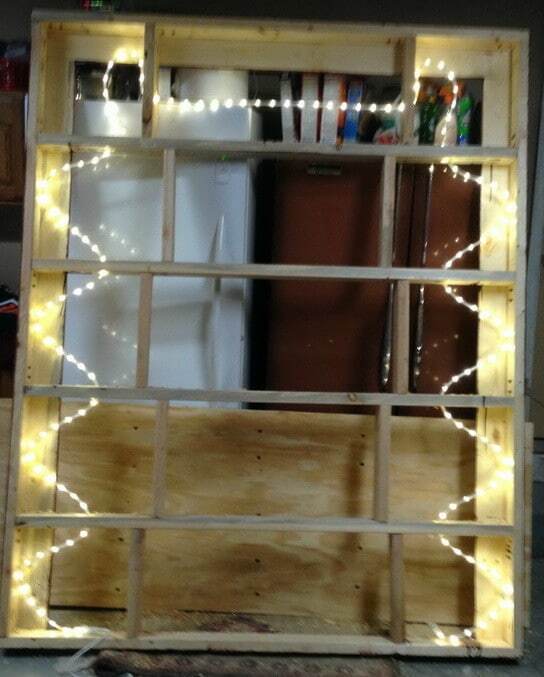 Bought the lights at wall mart for about 30 bucks. And went with fir 2×6 and 2×10, and cedar 1×6 for everything else since oak was $6 a foot. But looks nice and am happy with the outcome. Not sure some folks should attempt this project after seeing their questions, but seriously, good luck to everyone. The IMPORTANT question is, how well does the mattress stay on the bed? if you were to get even just sleep restlessly as I do, is there a chance it will slide around? or does it seem secure? I have a regular bed but planning on something like this… on my current I have one of the anti slip mats you would use under a rug between the box springs and mattress, I guess that would help here to if needed?? Important: make sure you buy wood that’s specially made so as *not* to give off toxic gases like formaldehyde, *especially* when using it in a bedroom. I think in the U.S. you want “furniture grade”. A lot of dumb questions being asked. If you can’t figure out the basics from the pictures you should probably put on a helmet and stay the heck away from power tools. whats best for the base and frame? 2×4, 2×8…? Is there a good video for making a queen? hey i have got this all sorted wood wise just wondering wether you used screws or nail and how you did this for the assembly of the frames. Using small wood screws is your best bet. What kind of wood did you use? Would you use it again or would you recommend using something different? Use a Maple variety or Oak for sturdy construction. 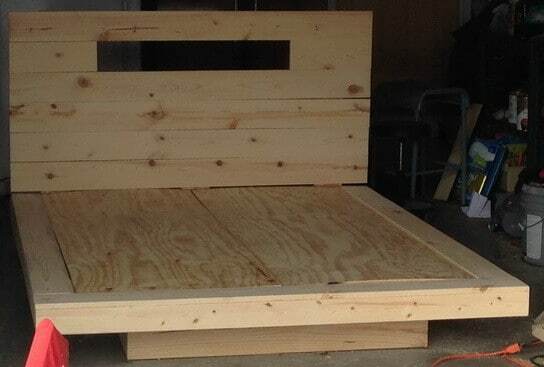 What is the bill of material for a queen and king size floating bed frame; i.e., how many 2×4’s, how many 2.6′ or 2×8′, size and qty of plywood, type and qty of required hardware? Is there a dimensioned plan available? Two questions. One, what size bed did you guys build this for? Two, how many inches/feet is the lower support from outside of the upper frame? Thanks. My bed is at the end of a hall way. 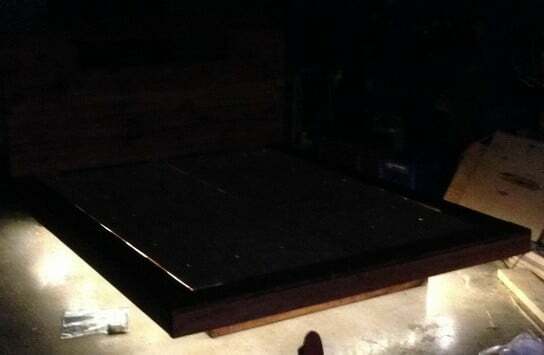 Seem to me it will simply appear to be a platform bed. What makes this floating when you can view so much of the bottom support? The lighting creates the illusion. If your bed is visible from a long hallway, the effect may not be great but at night with the under lights on, it will create the illusion. 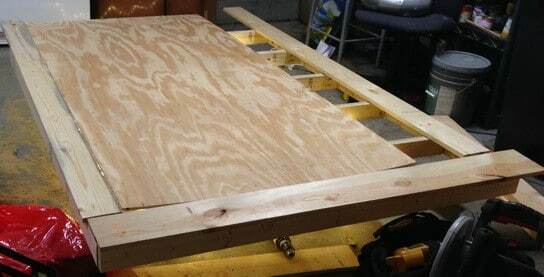 how did you attach the headboard boards to the 1×6 and then how did you attach that to the frame? Drill hole, use long bolts with lock washers. How do I attach the top frame to the bottom frame? Use either 1/2 or 3/4 inch thick plywood. 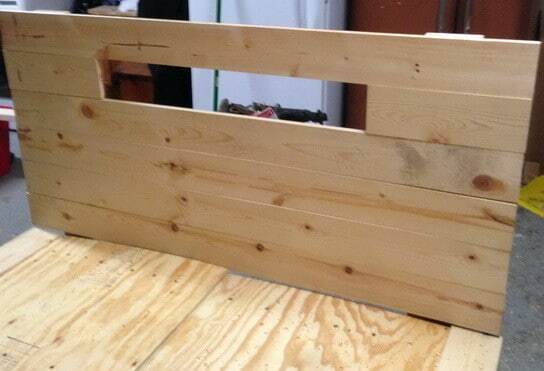 Use a thicker plywood for a stronger frame. Hi, my name is Nick and I am going to attempt to build this bed frame with a full size mattress. Is there any way you could help me by getting some of the dimensions for this project? Thanks. A “Full” mattress is 54”x 75” (inches). You will obviously have to make the bed frame bigger than the actual mattress size. We would recommend making the frame only a few inches wider (on the sides, front, back) without having too much of the wood frame hanging off the sides. If there is excessive width to the frame, it will just be something you hit your knees on constantly. Build the top portion of the frame first (where the mattress will be sitting). Next construct the bottom portion. When you build the bottom portion be careful with how wide and how long you make it. Remember, it needs to be the proper size to support the bed when someone is sleeping or sitting on the very edge of the bed (so it does not tip over). At the same time you don’t want it to be to wide because it will not have the appearance of “floating”. Just a suggestion… If you were to wrap the lower bed support with mirror tiles or some el’ cheapo wall mirrors, it would add to the floating effect as the floor covering would be reflected. Basic magic trick stuff. Would probably increase the light effect as well. Can I have actual blue prints or specs of actual design so I can build one too the specifications of a cali king bed? We do not have actual “blueprints” but here is a video that will help you to build a California King bed frame from scratch for about $150 dollars.